Bremen is a buzzing Hanseatic city on the Weser River, which delightfully feels like stepping back into the 15th century. Even on a gray day, the Altstadt (Old Town) glitters in all its glorious gilding and the Gothic Town Hall is beautifully baubled and blinged out. We really only scratched the surface, but these are the eye-catching landmarks and things we think you shouldn’t miss while visiting Bremen. The heart of the Marktplatz is the 600 year old Gothic Town Hall and the stone Roland statue, which are a UNESCO World Heritage Site since 2004. The almost unchanged Rathaus (Town Hall) charms every visitor to the city and when you take a guided tour to see all its splendors, it’s no wonder. There is a vast contrast to the lower and upper halls; the lower is simple and keeps secret the treasured jewels that await you in the Upper Hall. As the focal point of political life for centuries, the Upper Hall is filled with impressive wall paintings, epigrams, stained glass, and figures each with their own story of Bremen’s past. The crown jewel of the Town Hall is richly ornamented The Golden Chamber. The wall covering is the finest leather in red and gold. But it doesn’t stop there; every single element in the room, no matter how seemingly insignificant, is a work of art. It’s here that Bremen’s most important guests, like Queen Elizabeth and Kevin Costner, are received when they visit Bremen. In front of the Town Hall stands Roland. Roland statues can be found in many cities in northern Germany as he is a symbol a freedom, but Bremen’s Roland is the largest in Germany. His knees are also unique from any other Roland statue and the citizens of Bremen believe that as long as he stands, Bremen will always be free. Guided tours of the Town Hall are at 11am, 12pm, 3pm, and 4pm Monday – Saturday and at 11am and 12pm on Sunday. Tickets are €5 per person and children under 12 are free. The tour last 1 hour. The beautiful Upper Hall and The Golden Chamber aren’t the only secrets the Town Hall holds. Below it is the Ratskeller, one of the oldest wine cellars in all of Germany. 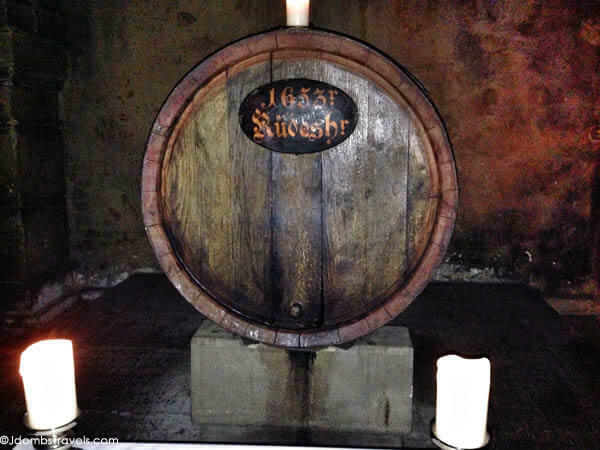 It was erected around 1405 and German wines were stored and sold in it. It still houses wine today, with around 12,000 labels including a barrel of the UNESCO protected Rüdesheimer wine from 1653. Unlike the prestigious Hôtel de Paris Monte-Carlo Wine Cellar, which isn’t open to the public, the Ratskeller is with a guided tour. You can taste five high-quality German wines paired with chocolates like Riesling-filled truffles. You, of course, won’t get to taste the Rüdesheimer wine. The last person to be offered a taste was Queen Elizabeth. The Mayor of Bremen also has the privilege of tasting the Rüdesheimer once in his life, though the last couple mayors have declined in order to preserve the heritage of the wine. Even Kevin Costner couldn’t secure a glass. Instead, he requested to enjoy a glass of wine while sitting in the chamber with the Rüdesheimer and was obliged. We did get to see the barrel. It’s in a chamber all on its own, which you reach by walking through another very dark chamber aptly named the Apostelkeller because it holds 12 barrels named after each of the 12 Apostles. These are also very old wines, though none nearly as old as the Rüdesheimer. The caramel scent of a several hundred years aged wine hits you before the locked chamber door even opens. I imagine that the Rüdesheimer is incredibly sweet after all these years and almost syrup like. Since we’re not royalty, I’ll just have to take Queen Elizabeth’s word that it is amazing. Guided wine and chocolate tastings can be booked on an individual or group basis and are €30 per person. Call +49 0421 33 77 871 or email [email protected] to inquire. The Bremen Ratskeller is also one of Germany’s largest wine restaurants. Even if you don’t want to do a wine tasting, you can still experience the atmosphere of the cellar while enjoying a delicious meal. There are also over 650 wines on the menu, so there’s sure to be a wine for every taste. A donkey, dog, cat, and rooster all past their years of purpose on the farm decided to set out together on a journey to Bremen, because it was known for its freedom. On their way, they came upon a farmhouse that was being robbed. Standing one on top of each other, they made a strange sound and scared the bejeezus out of the robbers. They were successful in scaring the robbers away and, since no one was home, settled in for the night in the cozy cottage. They never technically made it to Bremen, but you can see the Town Musicians all around protecting the city. Bremen’s Altstadt (Old Town) is shaped like a tear drop and stepping off the market square, you’ll find yourself in a maze of brick porticoes. Peer in the windows at the Bremen Bonbonmanufaktur as candy makers hand-make sweet treats like lollipops in a copper cauldron. Pop in to the chocolate shop for a tasty souvenir to bring home. Germans love their liquor filled chocolates and you can find an excellent selection of handmade truffles and chocolates at The Hachez. International flights are available to Hamburg. Bremen is around a 2 hour train ride from Hamburg. All the sights of Bremen can easily be seen by foot or by using the metro system. The 2-day ErlebnisCARD is €11.50 per person and gives you free access to ride all the buses and trams in the city. You also get discounted entrance to many of Bremen’s museums and guided tours. Some other guided tours we would have liked to take: Eat the World Bremen culinary tour, Beck’s Brewery Tour, and the Night Watchman tour. Great article. I’m visiting Bremen in August, and now know what to look out for. As usual, an interesting article. I admit I’d fancy chocolate tasting and listening to local musicians 😉 (apart from visiting famous places and off the beaten path streets). 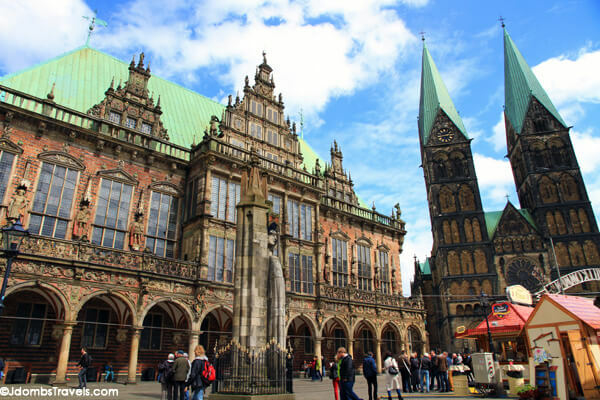 Bremen is not a hard place to travel around, once you have an eye for the place and know a couple of local landmarks it should become pretty simple. You can cover a lot of the city as a pedestrian but ensure not to venture into unknown territory at night. If you wish to cover larger distances across Bremen there are a few more options. There are safe and reliable buses where passes can be bought to include multiple trips on more than one day. There is also the alternative to use Bremen Taxis, but be aware of slow moving traffic at rush hour. What ever method you use to explore Bremen make sure you see as much of the city as your can.